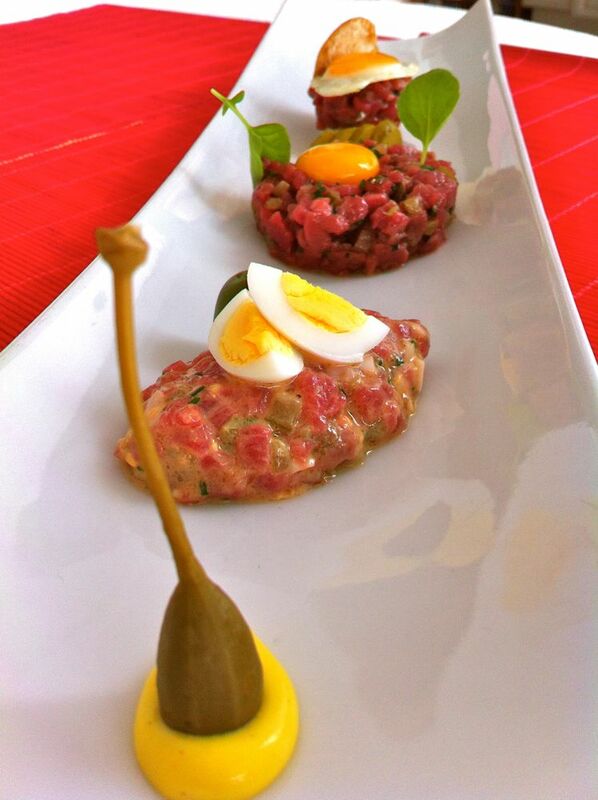 Chopped beef seasoned with the classic tartare flavors but in three ways and my way! More delicate and with these cute little quail eggs in three forms. For the cut of meat is not necessarily to go for the fillet. There's more . The fillet might be the most tender part but not the tastiest . Ask your butcher for some tender cut from the hip . 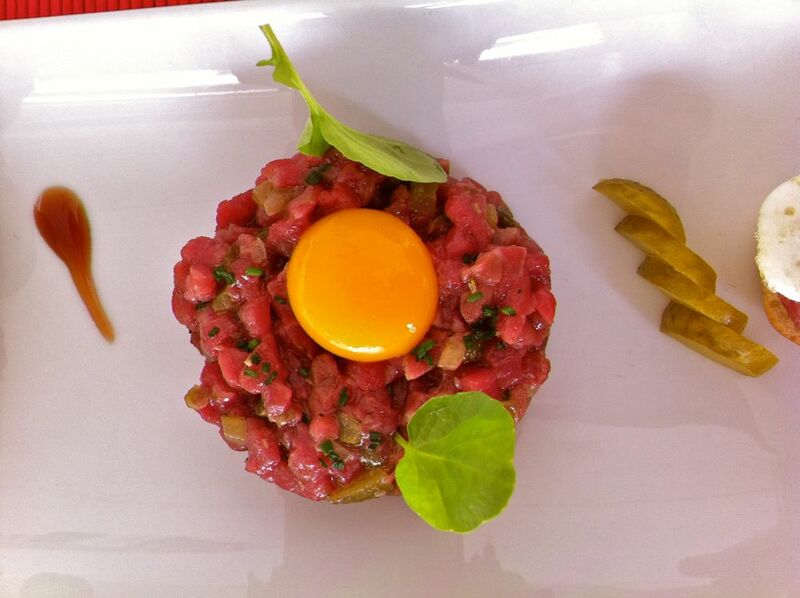 They are fat -free , very tasty , tender and on top at lower price .The steak tartare it's also great with horse meat. 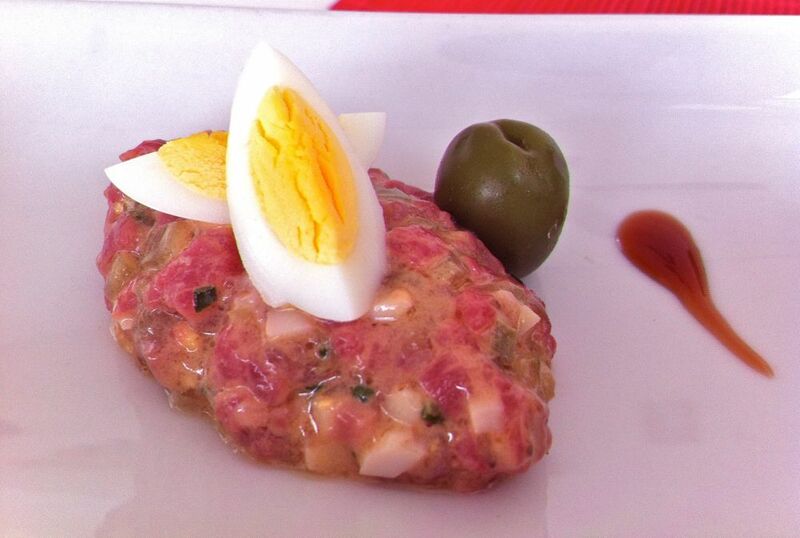 The toppings for this recipe are the classics of tartare with some variation or omission. For the capers I prefer to use the salty type, while the gherkins I like the German sweet and sour cucumbers "gurken"!. The onion in my opinion covers the delicate flavor of the meat, so I just use chives. I make an exception for the " tartare burger" where I add little onion after it has been rinsed with water to lighten it up. Possibly once the meat is seasoned, let it stand a few minutes in the fridge. The cold temperature will help to enhance the flavor . To start chop all the meat finely by knife and divide it into three parts and then dress it in the following ways : 1 The classic with the egg yolk In a bowl mix a couple tablespoons of extra virgin olive oil with a hint of mustard, some chopped salted capers , a bit of chopped gherkins, a few drops of sauce lea perry ( Worchester sauce) , chives, salt and pepper. Season the meat and serve with egg yolk above. Some people add the anchovy but I avoid and discourage. If you have tomato jam , try adding a little less than half a teaspoon ! . 2nd Tartare with tartar sauce, hard boiled egg and olives In a bowl mix the meat with a drizzle of extra virgin olive oil with a hint of mustard, some chopped salted capers , a bit of gherkins, a few drops of lea perry sauce( Worchester sauce) , chives, pepper, salt and a spoon ( not full ) of mayonnaise. The classic sauce also has onion but in this case I avoid it. Add 3 boiled eggs and 2 green olives chopped. For a perfect cooked quail egg , dip them with the help of a spoon in a pot of water once it begins to boil . Counted exactly 4 minutes and cool in running water. 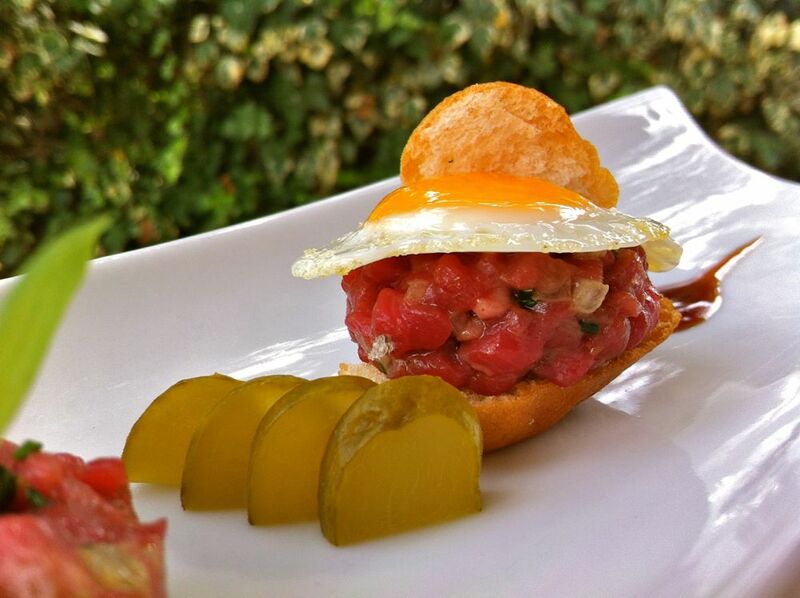 3rd “tartare burger” Take a spoon of finely chopped fresh onion and rinse them in a colander under running water to remove that strong flavor. In a bowl mix a couple of tablespoons of extra virgin olive oil with a hint of mustard, a few drops of sauce lea perry ( Worchester sauce) , pepper and salt. Fry 2 eggs as if they were chicken eggs but gently ! . Toast 4 slices of pan brioche and add the meat and the fried eggs.